Suzanne Rozdeba Margaret Hearn in the room where Josephine Ruta slept, and died. 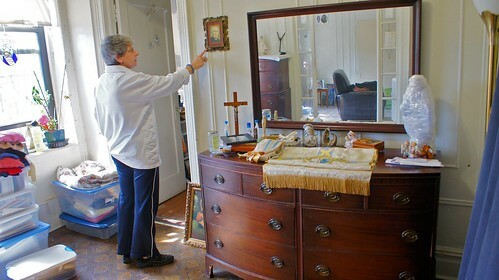 Margaret Hearn pays just $291 per month to live in a sprawling, three-bedroom apartment on East 12th Street, surrounded by a dizzying clutter of church relics, purses, minks, and souvenir ashtrays that once belonged to the former tenants. It’s one of two apartments Ms. Hearn keeps: for 20 years, she has also had a 300-square-foot alcove studio in Gramercy, where she pays $747 per month. Before you get jealous of this enviable arrangement: Ms. Hearn claims she doesn’t live in the rent-stabilized Gramercy apartment. She has merely been keeping it as security. That’s because the landlord of her rent-controlled apartment in the East Village is attempting to evict her. In fact, she might just lose both apartments. Suzanne Rozdeba The Ruta sisters. 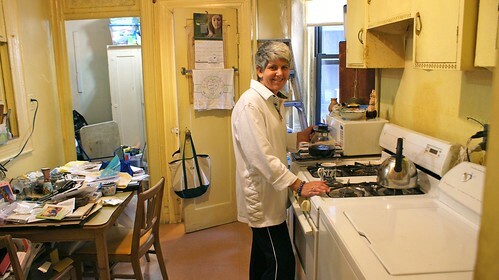 Ms. Hearn, 48, believes she is the rightful heir of the apartment at 345 East 12th Street. She claims that in 2008, Josephine and Margaret Ruta, known as “the Church Ladies” of Mary Help of Christians, asked her to share it with them, and she cared for them until they died. “Josephine, or ‘Jo Jo,’ as we called her, and Margaret invited me to live with them and they called me their daughter,” said Ms. Hearn. The Ruta sisters had lived in the building since the 1920s, after their family emigrated from Italy. Ms. Hearn said she and the siblings, who never married, met at mass in 2006 and soon became inseparable. “We would walk out for pizza down the block and went to church every day,” she said. Suzanne Rozdeba The Rutas’ parents. Margaret Ruta died in March 2011 and her sister Josephine followed her a year later. “I was by Jo Jo’s bedside when she died, and by Margaret’s,” said Ms. Hearn. After attending Josephine’s funeral services Ms. Hearn returned to the apartment she had shared with her, only to find herself locked out. “When I got back from her funeral, there was a padlock on the door,” she said. Clearly, Ms. Hearn’s landlord didn’t believe she had a right to inherit the apartment. On April 30, she was served with an order to vacate within 21 days. (The landlord later claimed this was when it discovered Ms. Hearn was residing in the apartment: the order was addressed to “John Doe and/or Jane Doe”). In papers dated May 29, the landlord, 339-347 East 12th Street Investor, LLC, asked a New York Civil Court judge to evict Ms. Hearn, arguing that after Josephine Ruta’s death, “there were no persons occupying the premises who were entitled to succeed to the tenancy.” The reason: Ms. Hearn “did not contemporaneously and primarily reside with Josephine Ruta at the subject apartment for at least two years prior to the time she died,” the papers said. Suzanne Rozdeba Holy water from Mary Help of Christians. In order for a tenant to remain in a rent-controlled apartment that was in someone else’s name, the tenant must prove that he or she is either a family member of the previous tenant, or was a “non-traditional family” member and had an “emotional and financial commitment” to the previous tenant. The successor must also prove that he or she has been co-habitating with the previous tenant for at least two years – or one year in the case of individuals with disabilities. Since 2005, Ms. Hearn has suffered from a crippling depression and anxiety disorder that, despite treatment, has prevented her from working, she said. Ms. Hearn said her lawyer had submitted proof that she was receiving disability benefits from the Social Security Administration, in a 1,000-page document that also named 14 witnesses who could testify to her East Village residency. One of those witnesses was her brother Andrew, who had helped her remove the padlock after Josephine’s funeral. Suzanne Rozdeba The Rutas’ purses. Mr. Hearn told The Local that the Rutas treated his sister like family. “They loved having her there. She took care of them – bathing, washing, changing diapers, the whole thing – for well over two years,” he said. Dr. Ellsworth Hutchison-Hall, a longtime friend of Ms. Hearn’s and another witness in the case, said there was “no question” she was a member of the family. “Margaret did for those women what I hope my children will do for me when I reach that point,” he said. In addition to the witnesses, Ms. Hearn said, her lawyer also offered proof of residency in the form of her authorized signature on the Rutas’ checks and on package deliveries; car rental receipts from driving them to visit family members; and letters indicating that she would pay for home health aides for Josephine if she could not afford them. Suzanne Rozdeba Ms. Hearn with one of the Rutas’ souvenirs. But what about the Gramercy studio? Ms. Hearn said Con Edison bills totaling about $15 a month show that it wasn’t her primary residence. “I haven’t lived in that apartment since 2008, and there’s no one else living there,” she said. The lease for the Gramercy studio expires at the end of October, a couple of weeks after a scheduled deposition in the East Village case. Ms. Hearn said she hoped to be able to keep the East Village apartment so she could let go of the other one, thereby cutting the amount of her disability checks that go to rent. But she acknowledged that, if she couldn’t stay in the East Village she would have no choice but to renew her Gramercy lease. Suzanne Rozdeba Ms. Hearn and the Rutas. There’s also the possibility she’ll lose both apartments. If it’s true that Ms. Hearn doesn’t keep the Gramercy studio as her primary residence, her landlord would have the right to refuse to renew the lease. There’s little doubt which outcome she’d prefer. “Twelfth Street is my home,” she said. “That’s where I’ve laid my head for the last four years and enjoyed great sense of family. That’s where my neighborhood is now,” she said.